Even though I just made this account, this site was very helpful back in my Java 2D days, so thanks to all of you. Anyway, this is the first project that I have finished and published after about 1.5 years of programming. I made a much more primitive version of it with Java 2D in the past and decided to re-explore the concept for my first “real” game. It uses libGDX. 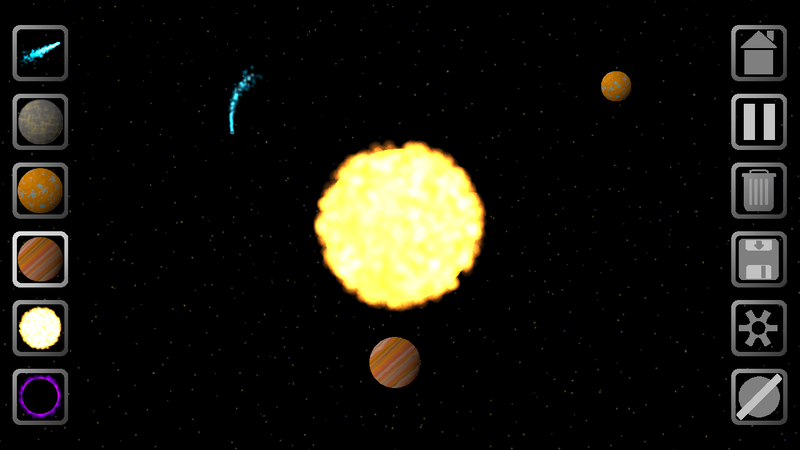 Space Sandbox is a simulation game where you can drag and release to create celestial objects and watch as gravity pulls them into orbits or into each other. You can also save the universe that you create and pull it up later. The physics is based on Newton’s gravity equation – the planets do not follow any kind of predetermined orbit or path. I did all art myself(Ui, planets, and background) via GIMP. I put it on Google Play just to say that I did, but after a couple of days, I got a download in Ukraine and the Czech Republic, which I think is neat. Thanks for 100 downloads! This app has done way better than I ever expected.